Every school I visited was participating in the suppression of creative genius. Sara Alonso in the EBU’s business team is working on a project called 47 Stones. It is all about the wisdom all of us carry. The young and the old. The famous and the non famous. Those being a worldleader or a even more important the mother of five potential worldleaders, which all of your kids are. It is about the wisdom that we need to share and pass along. Having been very busy at the start of my new job, I could only really speak to her in my third month. We had a good conversation and she gave me a book. I love it when people hand me a book. Not because I get something for free, but because it get’s me out of my usual path, that today more and more is being governed by big data algorithms. Someone giving me a book – handpicked somehow – is serendipity. Serendipity is going to become a very treasured good. But that is for a another blog or talk. 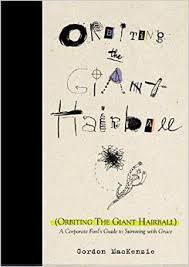 The book she gave me was “Orbiting the giant hairball” by Gordon MacKenzie, originally published in 1998. He worked at Hallmark Cards for thirty years, where he inspired his colleagues to slip the bonds of Corporate Normalcy and rise to orbit – to a mode of dreaming, daring and doing above and beyond the rubber-stamp confines of the administrative mind-set. Imagine : you’ve just been hired by the corporation of your dreams. It’s your first day of the job. You come bounding in, all excited about making a unique and valuable contribution. You are ready to fly when bam ! you run into an invisible wall. You turn : bam another wall. You turn again : bam another wall. Turn gain : bam again ! You are confined. Contained in a box called job description. Intended to make you accountable and containable, more often than not its net effect is to restrict you. I love guys like MacKenzie. The have great ideas and really inspire me. But they are many : Austin Kleon, John Maeda, Dan Roam, Seth Godin, Ken Robinson, … to mention just a few whose books I read. And what really puzzles me is : when in a company or in your personal life one is inspired and creative how to you turn that into a concrete output ? In many past projects I have seen good ideas strand because they couldn’t bridge to a great realization. Or is it just part of nature that for every AirBnb, Uber, Tesla, … many other ideas don’t take a real start ? “Orbiting the giant hairball”, Gordon MacKenzie, Viking Penguin, 1998.